It is widely believed that people have privileged and authoritative access to their own thoughts, and many theories have been proposed to explain this supposed fact. The Opacity of Mind challenges the consensus view and subjects the theories in question to critical scrutiny, while showing that they are not protected against the findings of cognitive science by belonging to a separate 'explanatory space'. 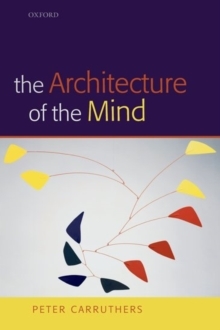 The book argues that our access to our own thoughts isalmost always interpretive, grounded in perceptual awareness of our own circumstances and behavior, together with our own sensory imagery (including inner speech). 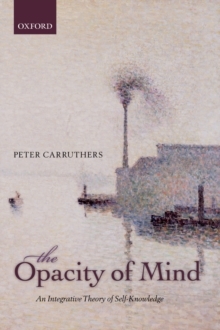 In fact our access to our own thoughts is no different in principle from our access to the thoughts of other people, utilizing the conceptual andinferential resources of the same 'mindreading' faculty, and relying on many of the same sources of evidence. Peter Carruthers proposes and defends the Interpretive Sensory-Access (ISA) theory of self-knowledge. 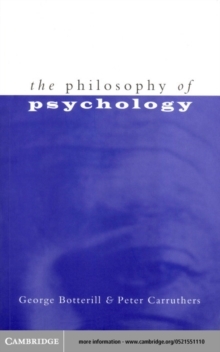 This is supported through comprehensive examination of many different types of evidence from across cognitive science, integrating a diverse set of findings into a single well-articulated theory. One outcome is that there are hardly any kinds of conscious thought. Another is that thereis no such thing as conscious agency. 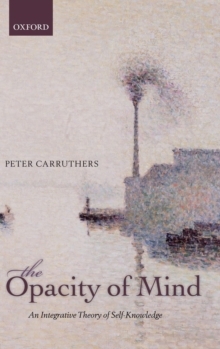 Written with Carruthers' usual clarity and directness, this book will be essential reading for philosophers interested in self-knowledge, consciousness, and related areas of philosophy. It will also be of vital interest to cognitive scientists, since it casts the existing data in a new theoretical light. Moreover, the ISA theory makes many new predictions while also suggesting constraints and controls that should be placed on future experimental investigations of self-knowledge.